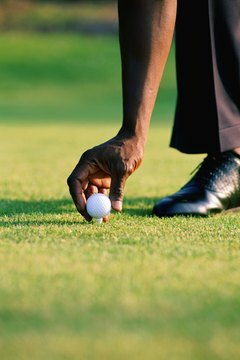 How Long Can I Play My Golf Ball? Although modern golf balls are built to withstand 125mph swings, off center or mishits will slice into the outer soft covering easily. Modern golf balls are made of materials that are much more durable than those of just a few years ago. According to Golf Digest, they can withstand swing speeds of up to 125 mph as well as most mishits without cutting or deforming. On the other hand, the covers of premium balls are susceptible to damage. How long a ball is playable depends mostly on the condition of the cover, which is easy to determine. The cores of today’s balls are made of polymers that are much more consistent and durable than the rubber bands and liquid centers used in balls of the old days. They can stand up to repeated high-speed strikes without changing shape or losing their resilience. The covers of golf balls now mostly consist of either a firm ionomer material or a softer urethane. The harder ionomer covers resist cutting and abrasion from bad shots and contact with hard surfaces. Urethane covers usually found on premium multilayer balls also resist cuts from poor contact, but they are more susceptible to scuffing. Surface damage to these extremely thin covers can come from cart paths, sand traps and even the sharp grooves of irons. In 2005, Golf Digest reported on the effects on distance of the condition and amount of use of golf balls. Its results confirmed that in the absence of visible damage, repeated use had no effect on a ball’s performance. However, it also found that even small scuffs led to a measurable loss in distance, reducing driver distance as much as 6 yards. The presence of water on the clubface can accentuate cover damage. It decreases the friction between the club and ball, which then causes slipping and grabbing by the grooves, leading to increased wear and tear on the ball. Drying the clubface with a towel before each shot can reduce this type of damage to the ball’s cover and prolong the usable life of the ball. Balls are likely to be lost or damaged before they wear out. According to Golf Digest, unless there is visible damage to the cover, the average golf ball should last at least seven full 18-hole rounds without any degradation in performance. A little lost paint or other marks that leave the contours of the cover intact are acceptable, but once there is a scuff on the cover that feels rough to the touch it is time to take the ball out of play. “Golf Digest”; From balata to urethane: Cover evolution; The editors; January 2001. Golf Digest: Hot List Golf Balls: How long should a ball last? “Golf World”; Does 'thin to win' work? ; E. Michael Johnson; Nov. 24, 2006. “Golf Digest”; Do clean balls make a difference? ; The editors; May 2005. How Is a Golf Ball Made? How Do I Clean Golf Balls at Home? What Is the Importance of Dimples on a Golf Ball?